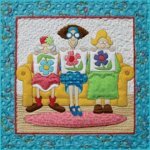 Eat Sleep Quilt pattern includes full size patterns, placement sheets, and instructions to make this 12 1/2" x 39 1/2" wall hanging. The technique is fusible applique. Appliqued pizza, appliqued bed and appliqued bolts of fabric complete with appliqued rotary cutter combine to create this cute "sewing room worthy" wallhanging pattern.